This bracelet has a primitive feel. 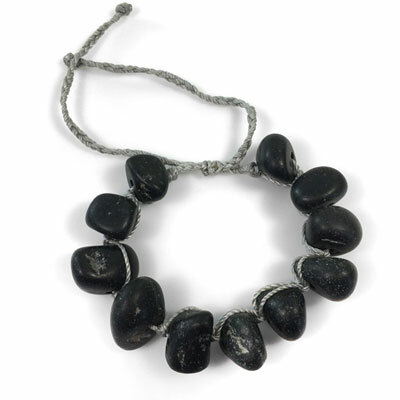 The black jade beads look like river stones polished by water and erosion. The bracelet is knotted and braided with a light grey colored nylon cord. Currently 2 black jade bracelets are available. The previous one has larger beads and is knotted with charcoal cord. One size fits all. 11 beads knotted with nylon cord. Beads 15-22 mm wide, by 10-12 mm long. Sliding closure. Adjust to wrist size.